Malone could wrap up the Division 2A title and promotion this weekend. A win against Cashel at Gibson Park and a defeat for Highfield at Queen’s would give Paddy Armstrong’s side an unassailable lead at the summit. However Armstrong knows that Malone must look after their own business and not worry what is happening elsewhere. “People are going to be asking are you looking at it but we are going to be focusing on the game,” he said. “It would be great if it happens but we’re not going into the game saying that has to happen. “We haven’t even mentioned it in training the boys are just focused on Cashel as it is going to be a tough challenge. “We understand that this is such a big game, The last time we played them it was probably one of the toughest games of the season. There has been a real good focus on it the last two weeks and we have been working in training. “I think it is credit to the hard work and attitude of the boys throughout the season. On Tuesday night we had one of the toughest sessions of the year and it was driven by the boys. Malone has amassed 503 points in their 15 games. “I think that comes from the coaches they have put a huge amount of work in, “added Armstrong. 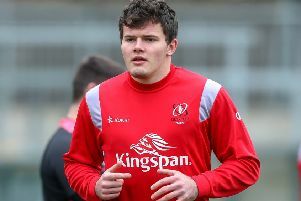 Matty Dalton is on the bench for Ulster at Cardiff but Joe Dunleavy is back. Queen’s have lost their last eight games and are without half backs Jonny Stewart and Angus Curtis for the visit of Highfield. Armagh are five points adrift of the playoff places and travel to basement club Corinthians.